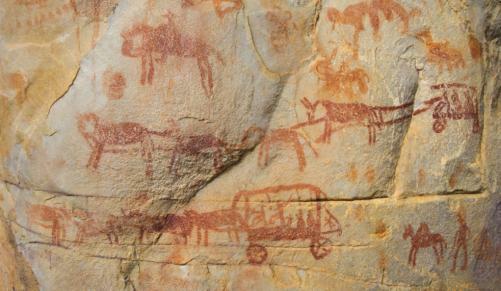 Khoisan rock art depicting European colonists on ox-wagons. The Korana or Kora were a nomadic Khoikhoi group that probably derived their name from a chief called Kora (or Gora), who was originally a leader of the Gorachouqua (`-qua’ meaning ‘people of’). This leader detached himself from this group with his followers and became the first great chief of the Korana. Others say that the name Korana could mean ‘the real thing’. Initially there were two main groups, the Great Korana and the Little Korana. Each of these broke into splinter groups that divided until there were many groups whose names have been slowly forgotten or were not recorded. Quarrels over water and grazing rights, or the ownership of women or livestock usually caused the divisions amongst groups. When parties split up they usually assumed the name of their leader. But sometimes they took the name of a place where they had stayed for a long time. One such case was the name Hoogekraal (`High Kraal’), the original name for Pacaltsdorp, near George. Korana family names tended to signify a special characteristic or occupation such as the Towenaars (Sorcerers) and the Regshande (Right-handers). Where the first Chief Kora lived is unknown, but in early times, most Korana lived near the Gariep, Vaal and Harts rivers and others moved into the Overberg and the Karoo. The last great Korana trek took place during the late 17th century, when they trekked from their chiefdoms in the south-western Cape to escape pressure from White settlers. These Korana trekkers travelled along the western trading routes as far north as the great river that they called Gariep, which means ‘river’. The early pioneers added ‘Groot’ (Great) to it, and after that, it was simply known as the Groot Rivier. A Dutch soldier of Scottish extraction, Robert Jacob Gordon, who was commander of the garrison at the Cape in 1777, renamed it the Orange after the Prince of Orange. However, many still referred to it as the Groot Rivier. After the 1994 change of government, it was given back its original name, Gariep. For many centuries the early people lived along this river and its tributaries because game was able to graze in the vleie and the berry trees and bulbous plants grew in profusion. There, the Korana settled among the Nama herders and groups of San hunter-gatherers. By then, the Korana had become well-armed and some sources cite that they lived very much in the style of the ‘Wild West’. They knew how to ride horses, understood the value of keeping their mounts in prime condition, and frequently raided the farms south of the great river and the Baster communities. They also settled in what is today the Free State, the district that became known as Koranaland (Gordonia). Many small conflicts over hunting and plundering took place between these groups and the Bantu-speaking peoples and White trekkers in the area. It is important to note however, that livestock raids were carried out by a minority group of Korana. An important leader at the time was Karel Ruyter or Ruiters, an escaped slave, who became chief of the Hoengei group of Gona in the Zuurveld in the mid-eighteenth century. Other leaders were Piet Rooi, Jan Kupido, Klaas Lukas and Pofadder. Klaas Lukas, who had his headquarters at Olyvenhoutsdrift (Upington), was the most powerful chief. The small conflicts over cattle and land raids came to a head in 1868, when the colonial government created a special magisterial district. The Northern Border Protection Act was passed to permit action against the Korana. A special border unit was stationed at Kenhardt, but the handful of police and burghers were too few to protect a 330 km stretch of land. This eventually led to the Korana wars of 1869 and 1878. In 1869, the Frontier Armed and Mounted Police and a small detachment of the Royal Artillery arrived in the area - led by Sir Walter Currie. Together with 400 mounted Boers and Basters, 100 Xhosa and 200 regulars, Currie was soon able to scatter the Korana – but the eluded capture. Klaas Lukas eventually captured the Korana 'raid' leaders and handed them over to the colonial authorities, who banished them to Robben Island. Later, a prolonged drought forced White settlers and Coloured farmers, as well as the Korana, to move closer to the Gariep River. Such a conglomeration of herds close made it easy for Korana 'raider' groups to prey on the herds, and their activities aroused the ire of the district. Klaas Lukas, who was initially neutral, gathered together 1,000-armed men to defend their livestock. His supporters included the majority of the Korana, the Nama Afrikanders led by Jacobus Afrikander, and a number of Griqua rebels under Gamka Pienaar. The Korana 'raider' groups were defeated and came under the control of the Cape Government. Those Korana who rejected a future under colonial rule trekked further into the Kalahari. The Cape Government settled the Basters near Upington to form a buffer between the Boers and the Korana. Today, the Korana have almost completely disappeared as a separate group through assimilation with the population in the area. ‘Bastaards’ or 'Baster' was a derogatory referred to offspring of liaisons between Europeans, slaves and Khoikhoi. The term was also used to refer to subordinate Blacks who could speak Dutch, ride and shoot. 2. The Khoisan from www.khoisan.org, especially the section on 'raiding'.